I am no longer updating here. The new website is this. All new updates are being done at the new website. I am planning to make some good material related to how to make a game. I thought that before releasing that I could probably share with everyone some of my experiences about how to make a game. I used this tutorial to make the maze. Here’s a picture. Compared to the maze given in the tutorial I made it much bigger. You can use the tutorial to understand how to make and perhaps add some other things. Like shaking the walls once in a while? Try it and tell me about your experiments. I used Visual Studio (express edition) as the software needed to make the game. Visual Studio is free to download and easy to learn. 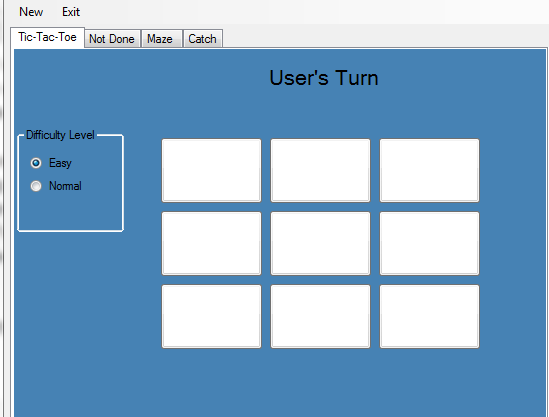 Another way I found was easier for a beginner to start making games is to use python. Python is a easy programming language. If you are one of the people thinking this then I say there is nothing to worry about. Python is easy. Very easy to learn. You can try this book out. The book is free to download and it teaches python by teaching how to make games. Finally I want to tell you about something that I am going to make games. I am learning Unity3D to make games. Unity3D is a game engine. It can be used to make 3D games. Just wait and see. I will add content about unity3D soon. For those who don’t want to wait here are some useful links. Unity Forum to discuss about the game engine and a list of tutorials to help you to learn unity game engine. v0.2 v0.3 v0.6 v0.7 . Download links and images page. It has been some time from the last time that I added some content on this blog “programming made a game”. It seemed to me that I had given up on this as the software “C Programming Made A Game” is on hold. So what am I going to write about now? What made me come back? From some time I was in doubt about whether I will succeed in making a game from programming or will I succeed in making programming a game? I had taken an example based approach for the C learning software and I knew that was correct way for turning programming into a game. But I thought it would be take a lot of time. So, what to do? I began to experiment. I tried Visual Basic, Python and even thought of taking up java to see which would be best for making a game. 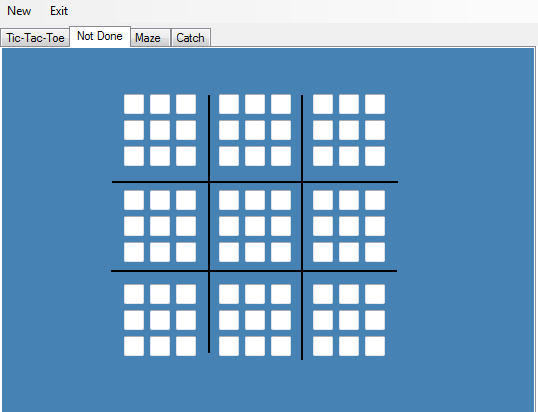 I made some little games with VB and python. Images of the Games made in Visual Basic are added below. 1. 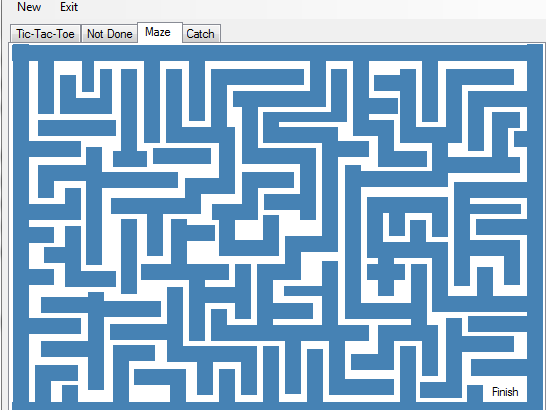 Maze:- This is a game in which we have to move the mouse from the top left to the finish at the bottom right. There is just one thing – whenever a wall(the blue thing in the picture) is hit the mouse goes back to the original position. 2. Capture:- This is a game in which letter move around randomly on the screen. Mouse has to be used to capture the letters. 3. Sudoku – I think everybody knows what Sudoku is. For those who don’t know check out wikipedia->Sudoku to find out. This game isn’t complete yet. But I wasn’t satisfied so I kept on searching and found out something great. Will update about what I found soon. A great link. Check it out. There are links to things other than learning programming also. I found this page just today. I want to make a game. I don’t care if it is a 2D game which looks like that it is from 1990s. Also if someone has some knowledge of visual basic then does somebody know any of these? how to index buttons or any control? Like a 2 dimensional array is indexed. how to make save files (NOT through the save dialog which asks the user to save the file). The save file that I need is for saving high scores in games or for saving the current data entered in a program. Released the v 0.8 of the software Download page. Completed Lesson01. You can also go to Downloads Page to download the older versions. How to use C language to shut down, restart computer, log off. How to make clocks using C language. The version 0.7 of the C learning software launched. Or you can go to the download pages for finding earlier versions. Somebody Knows How to make Icons?? I am making a software as a hobby. I was thinking about adding icons to it. I wanted to make something myself and not take something from the internet. Does anybody knows how to make icons? Or would it be easier if I just take icons from the internet? Started making Games using C language.